I figured it was time to a check in on my pantry stash. Doing my absolute best to not freak out as I itemize the contents of my pantry, but summer preserving season is a long, 4 months away. Pickled jalapeños are not a favorite. Same goes for pickled okra. Tomato sauce goes much more quickly than my precious crushed tomatoes, must stash away larger quantities next summer or curtail my use in the kitchen. I should use more of my peppers to stash away sofrito and will perhaps need to look into freezing raw/blanched peppers (see item 1). My ketchup estimates were spot on. Peach preserves have trumped pear butter at the breakfast table. Eggplant. I am missing it now that it is January. Will have to do some research on how best to save some of its summer wonder for our tummies year round. I’m gonna spend the rest of this week figuring out if there is anything that I can do to supplement our stash with winter preserves as I am sure that once summer rolls around I’ll be sad about the end of citrus and greens season. 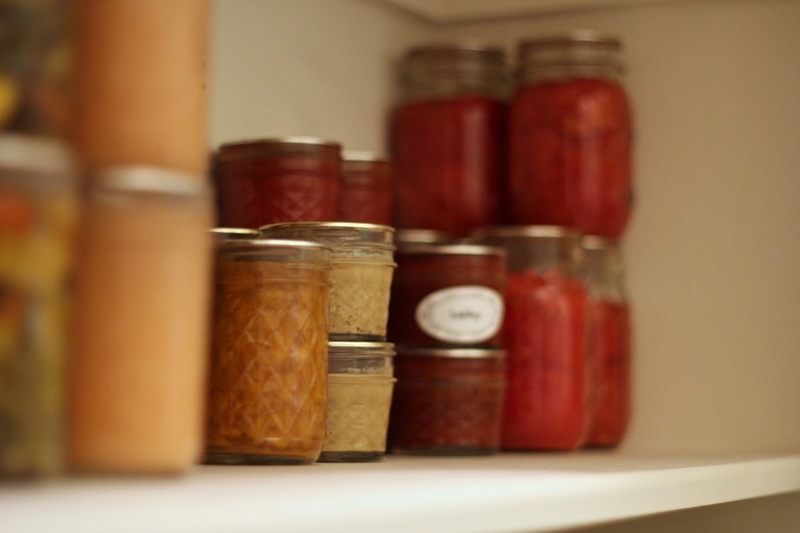 How is your homemade pantry doing?